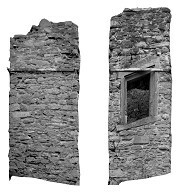 Photogrammetric documentation of all defense and supporting walls of the castle situated on top of a mountain. 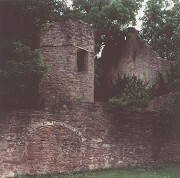 The task consisted of two individual parts: the subconstructural walls built into the slpoe to the west of the baroque castle and the medieval defense walls of a castle ruin situated on the other side of the palace garden. 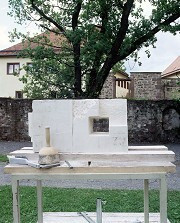 The documentation was carried out straightened to scale, using a scale of 1:20, in 68 photo sheets of the format 30x50 cm. The analogue photos were taken in the dimensions 6x7 cm, then scanned and digitally processed. At the same time measuring points on the object were recorded with a digital gauging station and filed in a database. This database provided a basis for the digital correction process. The time frame for this task was 20 working days.